There's always room for your frozen favorites inside this 22 cu. ft. capacity chest freezer. Spills ..
GE® 21.3 Cu. Ft. Frost-Free Upright Freezer Garage ready : GE freezers are tested to perform from 0°..
Maytag brand has got ya covered when it comes to keepin' your favorite frozen foods their chilly bes..
GE® 21.7 Cu. Ft. Manual Defrost Chest Freezer Garage ready : GE freezers are tested to perform from .. The Frigidaire Chest Freezer with Adjustable Temperature Control allows you to select the correct te.. The Frigidaire 16.6 cu. 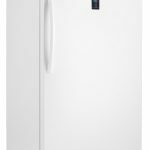 ft. Upright Freezer allows you to conveniently store all of your favorite fr..
Maytag brand keeps your favorite frozen foods their chilly best with this spacious 18 cu. ft. uprigh..
GE® 17.3 Cu. Ft. Frost-Free Upright Freezer Garage ready : GE freezers are tested to perform from 0°..
Adjustable Temperature Control : Select the correct temperature for your needs. Lock with Pop-out K.. Put a spotlight on your frozen favorites inside this 16 cu. ft. upright freezer with LED interior li.. The Chest Freezer from Frigidaire will be the best addition to oyur place. The unit features manual ..
GE® 15.7 Cu. Ft. Manual Defrost Chest Freezer Garage ready : GE freezers are tested to perform from ..